I’ve got Hamlet on the brain, I guess. I was thinking today about the wildly divergent claims Hamlet makes about human beings in the play. At one point, very famously, Hamlet begins, “What a piece of work is man!”. But at another point, less famously, he notes, “Man delights not me.” Is this just Hamlet’s antic disposition at work (or at play)? Or is there something else to say about it? For Maximus, the image is one thing, the likeness another. Human beings are made in the image of God—and, for Maximus, this is our essence, our Logos. But whether we are in the likeness of God is not a matter of how we are made; it is rather a matter of what we make of ourselves (and of course we can make nothing of ourselves outside of (non-hypostatically) participating in God’s life, i.e., we can make nothing of ourselves without our Logos)—and what we make of ourselves is our Tropos. Our Logos is what we are; our Tropos is the way we are, how we are. It strikes me that we can use Maximus to gloss Hamlet. In the vaunting passage, when Hamlet acknowledges what a piece of work we are, he sees our Logos. In the deploring passage, when he expresses his disrelish of us, he sees our all-too-human Tropos. 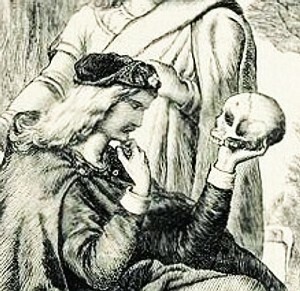 For Hamlet, we are made in the image of God, yes; but we all-too-rarely manage even to come close to God’s likeness.